Is there open space remaining in DuPage County? YES, and in 2013 an effort to create a new DuPage County Open Space Master Plan began. The county’s park districts and municipalities met for one year with a steering committee facilitated by The Conservation Foundation to discuss the lands they would like to see preserved for their communities. A guiding principle of the project is the importance of protecting our water resources and connecting greenway corridors, whether with trails or just a greenway for wildlife. Our task was to identify ways to link already preserved lands together to form an interconnected network of natural lands. 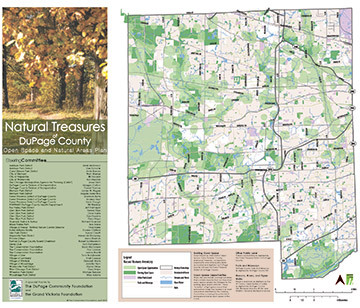 Click on the map image to view the DuPage County Open Space Master Plan and Natural Areas Map. Click here to read a press release announcing the completion of the Plan. Work has already begun on the next step, working with local communities and park districts to preserve these identified “missing links.” Thanks to funding from the Gaylord & Dorothy Donnelly and Grand Victoria Foundations, this plan will provide the road map to protecting DuPage County’s remaining open lands. To learn more about what we are doing in DuPage County, click here. For more information and to pursue your land preservation options in DuPage County, please contact our DuPage County Director Jan Roehll. Click here to email her or call 630-428-4500, Ext. 121.